Success in list building is not assured by selecting the right niche or adding people to a list. Just because you have included potential clients on your list does not imply that they will purchase your services and products. The following are tips that will be helpful when you want to build or alter a list – and make it as profitable as possible. You can’t just recommend services and products to people who don’t even know you. It is important to win their trust before attempting to sell anything to them. However, trust does not come easy; you have to work for it. The fact that you have an opt-in list does not necessarily mean that you are now a trustworthy seller. Begin by writing articles about your niche and let people see your expertise. You could then go ahead to create a forum on your website. This will help you extract important information about the needs of your prospects. Join forums in other websites and offer expert recommendations and advice. When people begin to trust you, you can then start your personal opt-in list. Build a relationship with other forum users. Ask them to sign up on your list. Provide a link to your website so that people can see what your business is all about. When customers believe in you, profits will start coming in. Customers just want to be assured that they are getting their money’s worth when they buy your products and services. Invest your time, money, and effort to find services and products which are of use to your subscribers. Do your research properly and profits will start rolling in. Remember to provide subscribers with promotional materials which can be used to spread the word around. This is beneficial especially when it is a person who owns a successful opt-in list. Such people have valuable experience and can tell you what works and what doesn’t. Though situations vary for different individuals, the advice received can still be very useful. 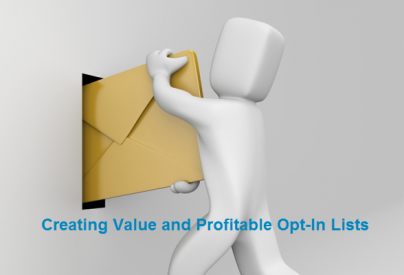 Building a successful opt-in list is not something that happens overnight. You will need to start the list from scratch and maintain its quality as it grows. This means you need to be very organized. It might even be necessary to hire professional help to ensure that you provide quality service to your subscribers. About the author: ZK is the co-founder of Web Marketing Blog where accomplished writers and bloggers share their tips, strategies and stories. Follow him on Twitter at @webtrafficroi.